Arrive at the Mboyti River Lodge. The drive is about 4 hours from Durban to the lodge. It is best to arrive before midday and avoid driving on the roads in the dark. After dinner you will discuss the next day’s plan with your skipper and Micro Light Pilot. They will know where and what the action has been and will make recommendations. Brekkie 06H30. The group can decide whether to have breakfast at the lodge first and take a packed lunch, or launch early and take a packed breakfast and be back at the lodge for a late lunch. Whatever suits the group or the Sardine action trend. Launch 07H30! The boats, one 8m rib and one cat, will be packed on the beach with your equipment waiting for the group to launch. The beach launch and can be the most thrilling introduction to the action awaiting you. Action 07H30 to 12H30 (weather dependent). The varied action can encompass the entire scope of what you have seen on the Discovery Channel. Usually the Micro Light, already in the air, will be advising what’s happening on the water within a 20Km radius of Mboyti. Once the action has been found its all stations go. You may prefer to enter the water with mask and snorkel or with scuba; or you may remain an observer on the boat. The action can be fast and furious, requiring you to jump in and out of the boat many times. You will welcome the exercise with all the food the lodge is feeding you. Micro-light Flips: Take a ride in the Micro-light to see the action and the coastline from a different perspective –AWESOME! The first 10 min is free, longer flights can be negotiated with the pilot. Walks: Ranging from serious hiking to casual strolls; experienced guides can show you the way. Indigenous Forest – Walk through the biggest coastal indigenous forest in South Africa. The forest forms the transition between the Kwa-Zulu Natal sub-tropical climate and the Eastern Cape’s yellowwood trees with unique forna and flora only found in this area. 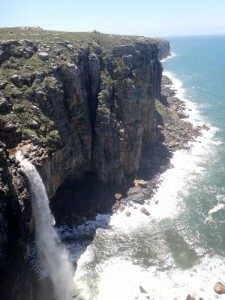 Waterfall Bluff – For the serious hiker, a 4-5 hour walk to the top of Waterfall Bluff — one of only 3 places in the world where you have a fresh waterfall cascading into the sea. This is a favourite on ‘no launch days’. Shark Point – A short walk along the coastline to a majestic point of rocks called Shark Point. 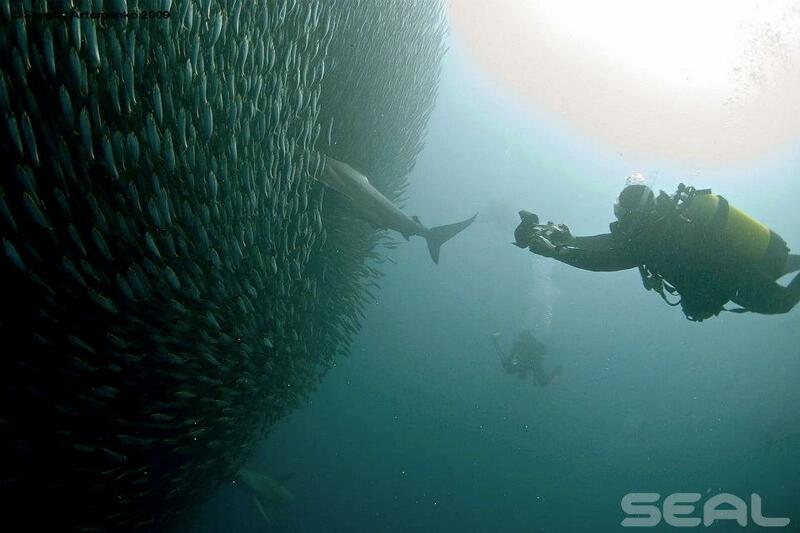 Watch the fishermen battle with large sharks or bring in huge Salmon or Kingfish. Drives: – Nearby are some of the most amazing waterfalls and gorges to be found anywhere. Magwa Falls – This is a seismic split in the earth that goes straight down for approx 100m, spectacular, only a 10-minute drive. Frazer Falls – Caused by the traditional erosion method, the gorge that follows is truly awesome, plunging 100m into some of the most unspoilt indigenous forest remaining on this coastline. Supper 19H00. Enjoy a 3 course meal– with fresh oysters served at the bar on Tuesdays, and a full seafood extravaganza on Wednesday… the chefs and staff are at your service. After dinner, chat with your skipper and the Micro-light pilot; plans are made and we all enjoy a cold beer. 07H00 – Breakfast is served for the last time. We say our farewells and prepare to leave the Wild Coast. MEETING POINT – Durban Airport for those being transported ( PLEASE TRY AND BE THERE BY ONE PM ) or Mboyti River Lodge for the self drives. LENGTH OF STAY – 6 nights 5 days at sea. Leave on the 7th day. PACE – Relaxed but can be strenuous if there’s good action. EQUIPMENT – Good mask, snorkel and fins a must. Splash jacket to keep the wind off a must. Weight belts and air provided. BOATS – One 8m rib, and one 8m cat, all safety gear and radio contact. INSURANCE – Consider obtaining DAN Insurance. CANCELLATION POLICY — Due to the expeditionary nature of this event there will be no refund for “No Launch” days.